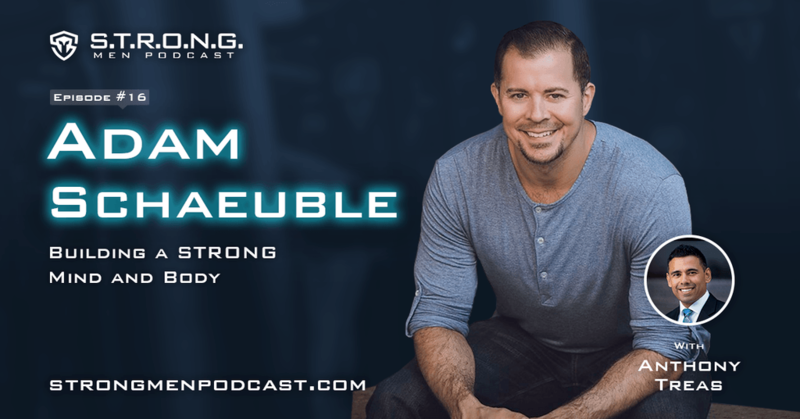 Adam Schaeuble (PHD = Previous Heavy Dude) Reveals How to Transform Your Mind and Body for Success! What does it take for a man to turn his life around, both mentally and physically? Adam Schaeuble explains how men can transform their health and mental mindset and make these changes last. Adam’s personal transformation is a testament to anyone who can visualize what they desire, and place themselves into the feeling of accomplishing their goal, can achieve. Once you understand the power of having a coach, someone to keep you accountable, you can achieve your greatest desires, if you truly want it! ​Are you ready to get started on your transformation? Schedule a free "Breakthrough" Strategy Session and get a personalized plan in place for you. ​Hello, and welcome to the strong men podcast, empowering men to thrive. I'm Anthony Treas from strongmencoaching.com where I share how men can start thriving in their life with purpose, confidence, and determination to live their best years, yet. I'm ready to get into this next interview with Adam Shaeuble. He is a man on a mission. And I'm excited. Because one of the things I talk about is man needs mission, a purpose in his life. And Adam is definitely living his mission. His purpose, Adam, welcome to the strong men podcast. Anthony, my friend, I am psyched to be here. And I know what a big deal it is, as a fellow podcaster, I know what a big deal it is for somebody to share their platform and their audience and invite somebody else into that. So it's an honor to be here and I'm fired up man, I am on a mission. I'm ready to share what that's all about. I'm excited because we met in person and it was great to meet you in person and get a chance to talk to you. We were at the new media summit in San Diego, California. And it was great because I heard your story. You heard mine. It's exciting now to be talking to you here. And where are you located at. I am home based in Bloomington, Indiana, in the heartland which is not so heart healthy, so it's a good place for me to be, I guess, doing my thing. Perfect. Perfect. It's amazing. You know, we met in person San Diego. And we're here having this conversation. Sharing this information, getting this information out to more men. So, Adam, tell me about yourself. What got you to where you're at right now. Well, Anthony, about 10 years ago, I'll bring it back in the way back 10 years ago, I found myself in a place where I weighed 327 pounds. I was a large individual dealing with some depression. I was in debt. I had a relationship where I actually had some hope around, I'm like, all this could be, the one, this is the girl that I want to marry. And then she had just told me that she was going to move an hour away. And that was just kind of a soul crushing. So, all these just, downward spiral moments were happening simultaneously. And, I remember the exact moment when I hit rock bottom. I was in a grocery store, like I said, as well over 300 pounds, just thousands and thousands dollars of credit card debt. Not sure if I could pay for my groceries, if I had room on my credit card to pay for the unhealthy food I'm ready to put in my body. And I remember going home from that. For whatever reason, the first thing I see when I walk in the door is there's a DVD sitting on top of my DVD player, back in the age of DVD. And any like millennials, like what's that? So, the movie inside the TV, this DVD was sitting there collecting dust and my friends had been dropping not so subtle hints, hints that I was kind of a crap magnet, which is a it's a scientific term for somebody who you don't want to be around. Because I was that guy. I was that guy that like, you know, I used to be fun to be around. But now, I wasn't because I kind of that crap magnetism was rubbing off on other people. And I was a downer to be around. And I, that depression was spreading. And it was like a virus. So, they're giving me personal growth and personal development material. That DVD was called, The Secret - The Law of Attraction. And so, I had had been collecting dust, because obviously, I was too cool for any of that stuff. And I remember for whatever reason, like I said, I walk in, and I see it sitting there. And I was like, Okay, I don't know what this is. But I feel like I'm supposed to watch it. I watched it. That was my first exposure to any sort of personal growth, personal development, motivation material. And it lit me up. And I watched it over and over again. And I sat down that night. And I mapped out exactly the way that I wanted to turn my life around, and what I wanted my life to reshape as and what I wanted to look like. And I gave myself a five year deadline, I went through a process writing out exactly what I wanted to achieve. I set rules. Like if, there had to be a deadline and had to be positive, I had to be written as if it already happened. I had to read it out loud twice a day, as if it had already happened with feelings. So, it wasn't like so many people set goals. Anthony, and you know, that's where they're like, Oh, I'm going to try to lose 30 pounds. Like just just saying that out loud. But that's, that's a week statement. Like, I'm going to try to lose 30 pounds, you know, it happens, it happens. But with me, it was I'm going to weigh under 300 pounds. I feel amazing. Because I can shop anywhere. I'm in a successful relationship. And it gives me energy. And like, I would write it like that. And I would read it like that. It was empowering. Long story short, I did this every day. And I read my, I call it my lifestyle rehabilitation statement. Because that's what I was doing. I read it every morning to set my mindset, to set my mind, and basically turn the lights switch on where I could see opportunities in front of me. And that's how I got rid of my crap magnetism. I could see what I was trying to achieve, and what time opportunities were there in front of me each day. And at the end of the day, I would read it again, out loud with feeling. And I had to ask myself the question, did I move the needle in the right direction in any of these areas? If the answer was no, I had to do something before I went to sleep. before I'd lay my head on the pillow. I had to move the needle every day, even if it's just a tiny little blip, even if it's just okay, I just did 50 pushups. And I could say that I worked out that was pushing me towards one my goals are. I drink some water, where I send an email, I read a book or watch a DVD, whatever, I had to do something every day. And so the magic of this was, I showed up in this way, with this mindset every day for five years, and I achieved every single goal. I lost over 100 pounds. That girl that was moving away, her mortgage fell through, just this weird circumstances started to happen. Her mortgage falls through, she has nowhere to live. She moves in with me now, in one month, in one month and six days, we are celebrating our 10 year anniversary. I eradicated my debt, no debt. And as I started to lose weight, people sort of asked me what I was doing. I started helping other people. This became a business. This became a boot camp in that five year time span my hometown, I helped them lose 35,000 pounds in five years. So I created a company, created a business; I created a team. And five years later, I walked through my brand new facility. I was actually seven days late on opening up my own facility. I was kind of pissed about that one. And there's like a zoning thing, which is always it, you know, you know, the local government always gets you. So I walk in, and so five years and seven days before this, I was 327 pounds in debt, depressed, not sure where my life was going five years and seven days later, I got this whole lifestyle rehabilitation process. I walk in at 6am to a brand new 8000 square foot facility that I had envisioned in my mind for five years. I walk in the door there are 100 people there, which I had envisioned in my mind for five years. I walk in there are 100 people there ready to learn from me, that was just like the ignition point of how my life totally changed, totally rehabilitated and now it's just been building consistent momentum from them. So that's that's kind of the long story, shortish that's where we're at today. Where we're really building momentum and helping as many people as possible. Well, that's incredible Adam and it's incredible to hear your story and just kind of those those little things that happened that got you to the point. I think it's some ways you knew that you were not, you called it a crap magnet, you know, your life wasn't the way you wanted it to be. And it was just this little subtle things that were happening that were going on that eventually led to that point, if we could go back, because I know a lot of men who are listening they see you, they see me these they're like, Man, you know, they have it down there. They're doing amazing things. How could I ever get to that point? So let's go back to that point where, you got that DVD and you're obviously not to where you're at right now. What are some steps? Or what were the steps that you took you briefly mentioned them. But as far as like taking somebody who is right now that crap magnet not living, they're overweight, or they're unhealthy? What was it like for you? And what are some of the minor steps is we've talked about before you just don't go from zero to 100, there's these baby steps that you need to take, or it's just not going to last long. So what would you say? Well, that's a great topic to discuss, especially among men, Anthony, because you're a coach, I'm a coach, and you're working specifically with men. And I see a difference between the way us as men get in our own heads versus the way females, that we all do it. But it's a little bit different and with guys, it seems like obviously, we have to let go of male ego. We have to realize we need help. Yeah, that was, that was the first thing like, I need help, I need accountability. I cannot figure this out on my own. I have to tag people in. I started getting workout buddies and I started, we started setting goals together. And I became accountable. And that was huge. I became accountable to showing up for those goals. And that was, you know, me letting go of ego, saying I can't do this by myself. Now, the other thing is that we have to let go of what I refer to as the, "I'm not there, yet", syndrome. Where we measure in the wrong direction, whether you're male, female, whatever. One of my coaches is a guy named Dan Sullivan. And he started a company called Strategic Coach. And this is what he does, he shows entrepreneurs ways to be more successful. So, the way he describes it is, we're all in this journey. We have that goal way out in front of us, and where we struggle as we are facing that goal. And every time we tried to measure, we measure between where we're at now, versus that goal. Yes, the thing is. That's the horizon line that keeps moving forward. We never actually hit there, you know, quote, unquote, there, yes. Because we just set that new goal that we set a goal of losing 30 pounds, we hit it, and we go, Okay, I want to lose 40 pounds, duh, that's the next stair step. So, we never actually get there. So, we're continuously frustrated because we're not there. And so just like you said, people will hear my story or your story of this huge transformation. And then we will start to compare ourselves to that and say, Well, I'm not there, it's going to be really hard to get there. But what we have to do is let go of the, "I'm not there yet", start our own journey. And then when we measure, we stop, and we turn around and say, Look how far I've come. That's what I'm proud of. That's how we measure. We measure from where we started, not to where we want to get to, we're inspired by where we want to get to that drags us forward. But when we measure, we stop and say, Look how far I've come. And I'm proud of that. Whether it's it's podcasting with my weight loss or with my business, I always measure from where I started, and I celebrate that. That's something that I feel like everybody needs to a little bit more of. That's a great point. One thing that I learned. And this was something that really hit me not too long ago, actually, where we kind of do look at these people who are doing amazing things. They have great coaching practices, they have great companies, organizations, and we're like, how am I ever going to get to that point, right? Like, right, they also had to start from somewhere, they were just sitting on the couch, just like all of us, they were putting on their pants just like us. And it was like, one day, like, I'm gonna start making these changes in my life. And it's really going off for your own measure, you know, your own set of values, and your own set of internal reasons why you want what it is that you desire in your life. And for you, it was you just felt crappy, you weren't feeling your best and you lost a relationship. And then it kind of was just tumbling. And I know, there's a lot of men who are facing those consistent downfalls. They haven't got a win underneath their belt, what would you say for men right now, they're just like, they're struggling to get that first win, they're struggling to get that first step going. Well, I think one of the big things for me was shifting my focus, because it's so hard to do. But once we do it, it's kind of like, I felt like I was standing in a hallway. And there were doors that were opening for me, but I couldn't see him because the light was just off, the switch was off because I was being so negative. And all I was surrounded myself was the pressure of my debt, the pressure of my relationship, not working out, the pressure, how I felt, and you know, the lack of energy and the stress. All that and then when I decided, just like, okay, it was almost like an experiment, just allow yourself the opportunity to experiment and say, you know, for next 28 days, I'm not going to focus on stress. I'm going to, maybe you write out a lifestyle rehabilitation statement, like I do, and you read that and you focus on positivity, because that positivity, flipped the switch, and all of a sudden, the hallway is lit, and I could see the open doors. And because they were there, and you know this to Anthony, those opportunities are there, I just couldn't see them because I was I was focused in the wrong area, my headlights were facing the wrong direction. So, just, I would say an initial step. Shifting momentum is maybe the hardest damn thing we have to do. But we're worth it. I mean, we're worth it. And we have to realize that shifting momentum, the first part of that is stopping negative momentum. Because all of a sudden, people feel like, well, I'm going 1000 miles an hour in the wrong direction, I should be in one day, going 1000 miles an hour in the right direction. No, that's not how it works. We have to stop the with the boulder is rolling down the hill it is right now. We have to stop the boulder from rolling before we start pushing it back up. So, we have to absorb impact and start to slow down the boulder. Stop it. And then we can start pushing in the right direction. So just take a little bit of pressure off of ourselves, do a 28 day positivity focus experiment, and that's going to stop the boulder. And then we start to slowly build momentum. And we start to set goals. You start to get a little bit of traction, ooh, I just met somebody new, haven't got a relationship going, or I got a connection. I read a book, I'm fired up, I set a goal. I've got a roadmap. And then I'm sure you see it with your clients and things like they start to build momentum. And that is just like rocket fuel. And then you're going and then all of a sudden you push that boulder usually with a coach, a friend, a group of people, and we get to the top of the hill and we kick it over. And that sucker just rolls. That's where I feel like I'm at right now. And you know, not to say that I don't hit some mini mountains that I have to uncover. As an entrepreneur that's always there. Like my fitness facility right now is like, under attack by different fitness franchises and things coming into town and trying to steal my clients, like, stuff like that happens. Life isn't perfect. Yes. And I'm not famous or fancy at all. I'm like, the least famous, my podcast got ranked. Some body on Facebook was like, You're famous! I'm like, if that's true. I am absolutely the least famous, famous person. Because, I don't know, I don't know about this. But that's the first. The initial mindset is yeah, don't expect things to do this huge 360 degree shift in a day, you have to absorb momentum, stop the negative momentum and then start slowly shifting that slow shift turns into a pretty fast building a momentum as long as we show up consistently. And that's where like you and I can come in and help people and help them get the momentum going. Adam, I really appreciate your honesty. And you've said it a couple of times. And I'm not sure if people have caught on to this. But it is difficult, it ain't easy. You kind of have these situations, it's obviously a million different situations that people could be in. But when you're in the crap, it is difficult to imagine a better life. It's difficult to make that first step. But as you mentioned before, and I like the word that you use, and I've used it to before where it's experiment, experiment in the next two weeks, or next week. Just focus on a positive statement, or focus on something positive that lightens you up for whatever reason, or just something that and just focus on that for the next week, two weeks, a month, see what happens. You're worth it. You are worthy to live an exciting, healthy life. When you just accept that. And it can be difficult because of people's different situations, different things that are going on in people's life, it can be difficult, and you bring up a great analogy where your life pattern right now it has that momentum, the boulder is going downhill, it has that momentum. And so it will continue to go downhill unless you do something about it. And when you recognize that, stop, I got to do something different. Because I'm adding more momentum to what's going on in my life. So, for those who are struggling with weight, what would you say for them was kind of a message for those men who are listening is like, yes, I have some weight, I need to lose and it is difficult. One of the things that I try to do for people that are on a weight loss journey on a transformation journey with their health is there are a lot of people out there willing to try and they're willing to work hard. And what I try to do is shorten the learning curve by giving you a visual, like a roadmap of here's where you're at, here's what's wrong, here's how we build a bridge over that. And here's how we can get to that next level. So I created a process to describe where most people are stuck that call the black hole of fitness. Doom and Anthony, you've hung out with me a couple times. You know, I like to name things everything. So, the blackhole fitness Doom is a circle. So I want you guys to imagine a circle there for parts. The circle, the top arrow arrow kind of circling around to the right is we start something new, we're fired up. I just signed up for p90x, I just signed up for Weight Watchers. I'm doing a boot camp, I hired a personal trainer, I'm doing paleo. I'm doing QA. It doesn't matter, we started something new. Next arrow going down the right side of the circle is we get some initial results. Momentum happens because it's new, it's a new stimulus. We're excited about it, right. And then at the bottom of the circle, kind of circling around to an arrow around going around to the left side is what I call the "life happens moment". And this is where we make or break the transformation. If we are ready for this, we are successful, we have a successful transformation. If we are not ready, then we go to the fourth and final section of the left side of the circle called, the crash and burn. And so, life happens, whether that's stress, stress eating, job changes, financial issues, relationships, injuries, sickness, things that are simple, like my kids just got out of school and a transition in the schedule. Something that's simple, all of a sudden, oh, I can. Now I can't go to my boot camp class. Because my schedule is different. Whoops, I didn't start back on my schedule went back to normal. And now, it's been six months since I worked out and I've gained on my way back. So that little tiny life happens moment, or a big one like relationship change, a job change, injury, but it leaves that crash and burn. Here's the thing Anthony, people go around and around and around, never making any real progress. And this black hole fitness doom. That's exactly what it is. It eats people up. And every time they go around, less willpower, less hope, they're eating up, their finances, their energy, the time that they invest in this and it gets harder, it gets harder on our bodies. But it also gets harder mentally. Like I've been through this before I started a thing I lost the way I spent the money and then I just kind of lost it. The first step for somebody that's one to change is to realize where they're at in this process and say, oh, okay, here's exactly where I'm located. And here's the pattern that I tend to follow. The next visual I want to give you is that that goal, that road, that talked about earlier, where the goal is at the other end of the road, we're at one end the goals that the other and I want you to visualize a giant hole in the middle of the road. And what most people do is they say, okay, I've set a goal, I'm gonna march right down towards that goal. And that whole represents that life happens moment, right? And we walk and we fall in. Powerful. And it is these different transitions that we never really prepare for, right? We go on vacation, the holiday season, New Years, that's going to be a big one for you. New Year's, in our children's schedules, all these different things. And you bring up a great point, because that's life. Right now. Men who are listening who are parents end of August, September is going to come at some point in this kids going to go back to school or Christmas is going to come around or spring breaks into come around, these things are going to happen, no doubt about it. So it's preparing in advance for those transitions. 100%. I always tell people with their danger zones, the skill you need to acquire is how do you identify, analyze, and prepare ahead for those. And if you can do that you're going to win the game. You don't have to get it every time. But we can't just put on the blindfold and go Well, I hope the holiday season next year goes better than did this year because I put on 40 pounds? No, that's not gonna work. It's just like you and I are businessmen. No entrepreneur out there. Whatever. Go like, well, man, we were down $50,000 that month. Hope that does doesn't happen again. We're going to analyze that and make sure it doesn't happen again. Yeah, we have to run our bodies like our business, you know that health. We don't want to go out of business of our own health. So that gives me Yeah, yeah, that's, that's the worst possible scenario. So that's where I think about at least. Going back to the whole experiment thing, right? Where for a man is listening, okay, I'm going to do this for this time period, right? Let's say New Years, or whatever, or kids going back to school, and that whole transition period, I'm gonna do this, they experiment, they do something and then either at work, boom, write that down have that as your go to your game plan, right? you're developing your game book, like football, right? They have their game plan the other game book if it didn't work out, try something different. Is that kind of what you're encouraging? Yeah, I love a 28 day experimentation period. Especially with with health and fitness. And sometimes we don't give the plan enough time to work. Like I tried this for three days. I haven't lost 50 pounds yet. This isn't working. And guys, especially susceptible. That guys, yeah, and I'm speaking as a man. So yes, and attest to that. I like the 28 day experimentation period, I created a tool, I'll send you the link for I give out for free. It's my best. It's like my best stuff. I'm a terrible salesperson. So I just give my best stuff away. I called the transformation battle plan and workbook. It's a growing document. I'm on version 3.0. Now. It's getting bigger and bigger. It's about 15 pages long right now. But it's just a 28 day. It's exactly what it is. It teaches people how to map out their goals, their danger zones, their fitness game plan, their nutrition game plan, and really getting dialed into the processes that I teach people so that we are aware and we can learn and that's what it's all about. It's not about being perfect. That's where guys especially we really mess it up going like, Oh, it's not perfect. It's not the perfect time to lose weight. So I'm not even going to start. It's not the perfect, it's the holiday season. Why would I start eating healthy now. I'm going to wait until January. When if we can't be at our best, we can still do our best. That's something that we as men or women, you know, whoever we get into our heads of that perfection trap. And you know, I had a major injury a couple years ago, right? I was doing awesome. Of course, race, I tore my peck and total, you know, reattachment couldn't work out for six months. And now I'm like, I'm the healthy workout guy. And I'm, I got to teach classes and do all this. I had to figure it out. And a lot of people would be like, okay, you know, what, what do you do, like, well, I can work my abs like my legs. I can work my other arm. I can eat clean. I'm learning about injury and how to come back from that. I can inspire other people like podcasts about it. And you know, you got to make the best of a bad scenario sometimes. And see, we can dig up out of that just about momentum. You know this as well as I, I mean, it's just you're going to add momentum, no matter what direction it's going. Like, if it's going negative, you can add a lot of negative momentum. If it's going positive, you can add positive momentum. But, that's ultimately up to us. We have to take personal responsibility over that. And just like I said, Be consistent and show up and take action in that direction that we want ahead. Incredible. Adam, would you be willing to share a recent health transformation for a man that you'd been working with? Or something unique really happened with someone recently? Yeah, one of my newer clients from my hometown has a guy named Chuck and Chuck, he is over 60 years old. And he's somebody that's been, you know, on diabetes medication. And like I said, I'm not the best salesperson. And my, my advertising strategies in town are not the best. So like people, people will go and try everything else out. And then somebody will tell them about my gym. Like, you need to go and find Adam. And so he walks in, and he's like, dude, I wish I had this is exactly what I need is like, I wish I'd found you five years ago, I wasted a lot of money and time. I'm like, yeah, I'm awesome at marketing. So we plug them in. And whether somebody is in my hometown gym, or an online client, we're launching online boot camps and programs. The formula is the same, it's another thing that I named called the "amazing results formula". Consistency with nutrition. Consistently with your fitness is strategic thinking, which means understanding our danger zones and how to fix those. And then we show up those first three things consistently over time. So we apply that and Chuck just dug in a very positive, very motivated, has a big why and a why now, which is a concept that I learned from you, and now he is showing up in a big way as first eight weeks. He dropped 30 pounds in his first eight weeks or two months. But the really cool thing is, he's no longer on diabetes medicine. So yes, and then he shows up, you can see the confidence in his eyes. That's my compensation. Anthony. And that's like, you see that fire light up and like, oh, man, that guy gets it. And now he's already down like 45 plus pounds. And is the talk I have to have with guys especially, we aren't always so fashion forward. And I'm like, Chuck, you gotta get new clothes. Dude, you look good. Clothes are hanging off of you. You look like a flying squirrel. And you're just gonna hide or something. So I'm, you got to get away from the triple x shirts. Now. You know, you're, you're into an XL, you know. But all kidding aside, the guy is rocking it. And the thing I'm probably most proud of is just that there's a lot of health and fitness people out there where you go to their website and it's all about them. And it's like, look like me. And you know, you can one day be as, have ABS like me, you can be abtastic, like Adam. Like, if I really want to market it, "Abtastic like Adam". Maybe that'll be my new program. Yeah, I don't know. But I'm really, really proud that when you go to my website, you see a Rolodex of other people. That's the differentiating factor, in my opinion, as a fitness professional, that's able to make impact. They're gonna be people that are in great shape and good looking. They're great at marketing. There's the person that's leading by example, which I believe I do, I am in shape, I've lost 120 pounds, but I can teach other people how to do that and change their lives. That's the differentiating factor between somebody who's great at marketing some, that's great at coaching. And that's, I'm focused on the impact, like, you know, I've said, this million pound mission goal, that's what I podcast on, that's the name of my podcast, I'm kind of very accountable to that. And we're tracking it and I know I will never reach that million pound mark, unless I help thousands and thousands of people and inspire them and teach them so, you know, it's, it's on me to help as many people as possible and that's, that's something I'm just super proud of. And I feel like it's a message that's kind of needed out there right now. Absolutely. Now, Adam, did you say, Chuck, he got off some medications? Yeah, he's off his diabetes meds. He's no longer considered a diabetic, which is how huge that. Now I love that it's another person that's not taking medication you know, and it's oftentimes a lot of people who are diabetic or pre-diabetic or have family members who are diabetic who think that's just what's going to happen to me and it's a life sentence and, and so I love that because it's not true people can get off medications, people can decrease their blood sugar levels and eliminate medication so awesome. I love it. Thank you for for one less person putting more money into pharmaceuticals pockets you know. I love it. Yeah, I've got I've got one other one other quick funny story popped into my mind I have to tell it because I feel like it'll resonate with like 99% of your of our audience here. We're guys we think a certain way. So, I had another guy that was on meds, a blood sugar, blood pressure med guy this was this guy's mindset. I have people track their water and I have them report every single day. They have to send a report to their accountability coach or we chase them down. It is not an option alright. So he sends his first day report and our coaches like, excuse me john light beer doesn't count towards your water goal. And like I know a lot of guys are like, what? It's basically water, ah, no. So that was his initial mindset of like, okay, light beer is water that's healthy. So we took him from that point to again a few months down the road. He's down like 60 pounds. But then he still like fighting the whole health thing. He's in a class he's getting lightheaded, he's like Adam I love all this stuff. But he's like I feel like this healthy eating, man, it's causing all this lightheadedness and like, he's like, serious. I'm like, think like broccoli and chicken is causing you to be lightheadness. I said, dude, it's time for you to get off the blood pressure meds. I guarantee you've lost weight. Your hydration is better. You're not drinking light beer is water anymore. And you are healthier. I said go to Dr. Let's see what they say. And that was the deal. It wasn't like the healthy food. He was hoping, gahh. I really need to start eating pizza every day game is as good as my head. But the doctors like okay, we don't have to take these blood pressure medicine anymore. It was actually lowering his blood pressure so low. He'd get up from doing the whole Yeah. And up and he's lightheaded because it's in his elevation. So that's just another example of men being men and kind of fighting the health thing a little bit, but letting go of the ego and realizing I can't help myself and I can turn my health around. So that's another good example. Yeah, that's powerful. And I'm really glad you said, hey, go see your doctor. And that it wasn't you telling me Stop your medication? Yeah, yes. everyone listening? Don't stop your medications. Go to your doctor. Yes. Powerful. Adam. Outstanding stuff. I love it, man. You're doing an amazing work. And I hope that yes, more men will find you and lose the weight. We do need more healthier Americans. You're doing a great job, especially as you mentioned, in your area, and around States and around the world. So any last message for the men listening who are maybe just sitting on the fence? Or maybe they just need just to hear another positive word of what would you say to them? Adam, how can people find you? Yeah, if you guys just go to my website, millionpoundmission.com. That's the hub. I really would love to have you guys check out my podcast million pound mission. I put out three episodes a week, and I light it up. It's high energy. And one other just real quick request for for listeners of the show. I'm super proud of Anthony. I feel like his voice needs to get out there. His message is needed. So I really want you guys to help promote his show, share out his stuff. But also go into iTunes and leave a rating and review. And if you liked this episode, specifically, wanted to mention the PhD, which that's me the "previously heavy dude" and let me know what you thought of our episode. But that helps with getting Anthony's message out there. If you're gonna do one thing, one action step that would be something if you got anything out of this feel like you want to pay it back a little bit then leave Anthony nice five star review on it tunes and that would be awesome. Thank you very much. Thank you for your message. Thank you for what you are doing across the world and for helping to improve the health and wellness of people who are then going to go out and do amazing things in their life and make this world a better place. So thank you for what you're doing. Thank you for being here strong men podcast, and for all those listening. I'm Anthony Treas from strongmencoaching.com and until next time, stay strong!